Mark Barrenechea, OpenText’s CEO and CTO, kicked off the analyst summit with his re:imagine keynote here in Boston amidst a snowy winter storm that ensures a captive audience. 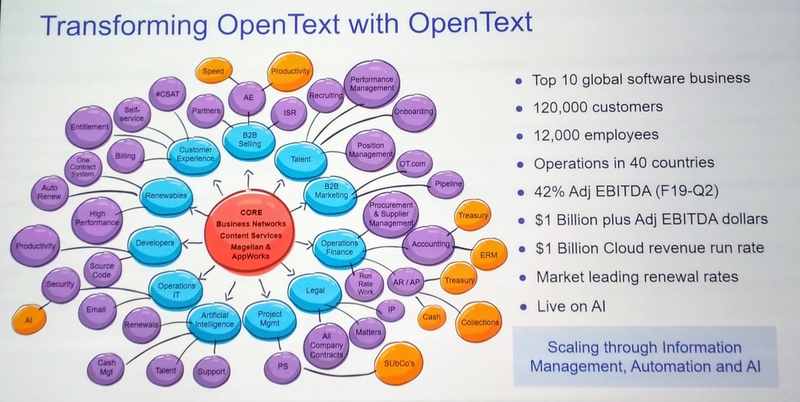 He gave some of the current OpenText stats –100M end users over 120,000 customers, 2.8B in revenue last year — before expanding into a review of how the market has shifted over the past 10 years, fueled by changes in technology and infrastructure. What’s happened on the way to digital and AI is what he calls the zero theorem: zero trust (guard against security and privacy breaches), zero IT (bring your own device, work in the cloud), zero people (automate everything possible) and zero down time (everything always available). Their theme for this year is to help their customers re:imagine work, re:imagine their workforce, and re:imagine automation and AI. 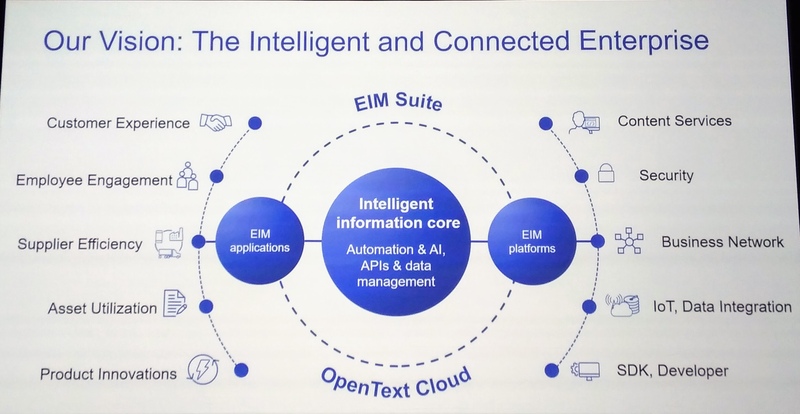 This starts with OpenText’s intelligent information core (automation, AI, APIs and data management), then expands with both their EIM platforms and EIM applications. OpenText has a pretty varied product portfolio (to say the least) and is bringing many of these components together into a more cohesive integrated vision in both the content services and the business network spaces. 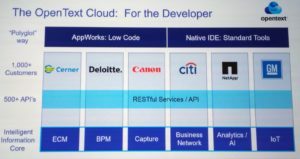 More importantly, they are converging their many, many engines so that in the future, customers won’t have to decide between which ECM or BPM engine, for example. They are providing a layer of RESTful services on top of their intelligent information core services (ECM, BPM, Capture, Business Network, Analytics/AI, IoT), then allow that to be consumed either by standard development tools in a technical IDE, or using the AppWorks low-code environment. 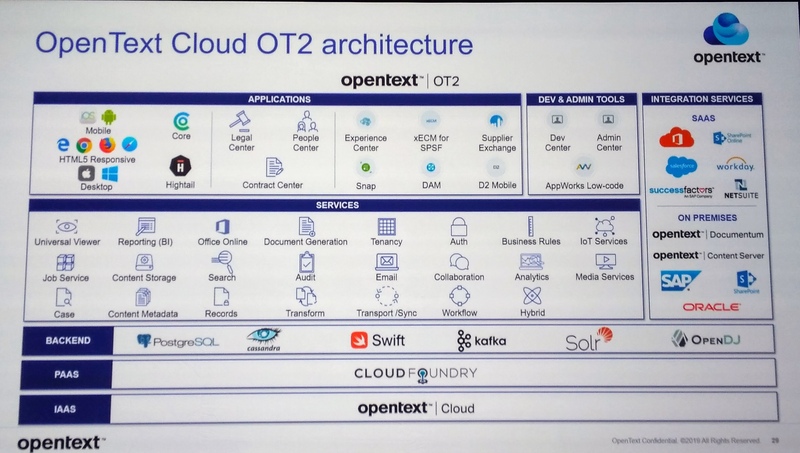 The Cloud OT2 architecture provides about 40 services for consumption in these development environments or by OpenText’s own vertical applications such as People Center. 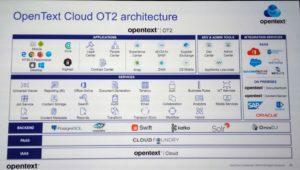 Barrenechea finished up with a review of how OpenText is using OpenText to transform their own business, using AI for looking at some of their financial and people management data to help guide them towards improvements. They’ll be investing $2B in R&D over the next five years to help them become even bigger in the $100B EIM market, both through the platform and more increasingly through vertical applications. We’ll be digging into more of the details later today and tomorrow as the summit continues, so stay tuned. Next up was Ted Harrison, EVP of Worldwide Sales, interviewing one of their customers: Gopal Padinjaruveetil, VP and Chief Information Security Officer at The Auto Club Group. AAA needs no introduction as a roadside assistance organization, but they also have insurance, banking, travel, car care and advocacy business areas, with coordinated member access to services across multiple channels. It’s this concept of the connected member that has driven their focus on digital identity for both people and devices, and how AI can help them to reduce risk and improve security by detecting abnormal patterns.